First up, you can now add a Rio 2016 frame to your photos – decorated with your team flag – because all your friends are surely very interested in knowing what teams you support. The company is also putting its acquisition of MSQRD to good work, adding face-paint filters in – you guessed it – the colors of your preferred Olympic team. You can download the app on Android or iOS and share your painted mug on Facebook – even via live video. 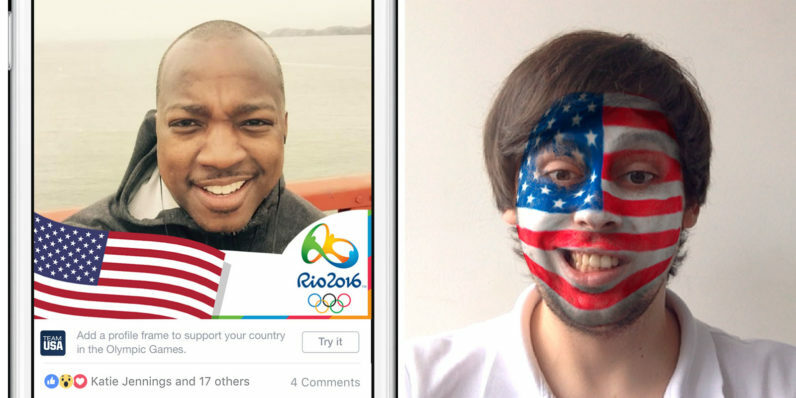 Finally Facebook is also debuting a personalized Olympics section to your feed. From now to August 5, users will see a prompt asking if they are “excited for the games” on their News Feeds, and can proceed to a page that mixes news, videos and conversations around the Olympics as tailored to your interests – or at least what the Facebook algorithm thinks those are. It will up again around the closing ceremony on August 21 . Basically, get ready for your Facebook feed to be inundated with Olympics news and patriotic photos. It’ll probably be the only time Americans come together this election year anyway.